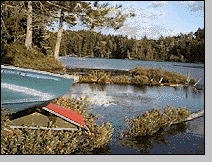 New York Canoeing within Adirondack, New York 6 million acre park in upstate New York: Lake Placid, Saranac Lake, Glens Falls Resource Directory..
Get the inside scoop on the best places to go Boating, kayaking and Canoeing, where to stay, who the local experts are and where to buy the best equipment! 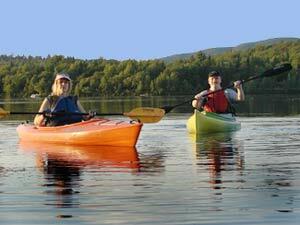 Blue Mountain Outfitters Blue Mountain Lake Open 7 days from 9 AM until 6 PM. Blue Mountain Lake, 144 Main Street, (518) 352-7306 We feature many crafts from hand pounded handmade black ash pack baskets, cloth, metals, jewelry, to balsam and clay. Blue Mountain Outfitters is a full service fly fishing outfitter offering proven names Fly fishing instructions and guiding are available upon request. Camping is permitted in the Adirondacks on state lands, and these areas offer numerous locations for overnight camping and day use. Adirondack Leantos are for the temporary use of overnight travelers and unless caught in a storm, they should not be used for more than one night. 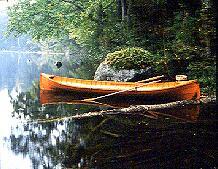 Canoesist should be prepared and carry their own tents in the event that leanto space is not available. In the event of cold weather, or buggy conditions a leanto is not the recommended form of overnight shelter. When camping on State land in the Adirondacks, larger groups must obtain an interior use camping permit for any overnight use (larger groups are defined as approximately 6-12 people). Smaller groups and individuals also require a permit from the DEC if they use the same location for more than three nights in a row. You need to get these permits in advance from the area forest ranger, whose address is available from the DEC.